A recent post on the Quest mailing list regarding choosing a location for technical diving training prompted me to examine my own experiences in this regard. I realized that I had learned a good deal about this matter both from organizing my own training, and also from participating in several other GUE technical classes. My conclusion was that choosing the location for your technical dive training has a significant impact on your training, and is far more involved than simply following the established guideline of “train where you are going to dive”. As with most things, the devil is in the details and once you explore this question a bit more, several issues become apparent. Thankfully, choosing an instructor is probably the least of all your concerns. GUE instructor standards are the highest of any instructor standards in the world and this essentially prevents you from making a mistake in this area. In order to teach GUE technical courses, a GUE instructor must meet or exceed requirements clearly spelled out in the GUE Standards. Included in these requirements are teaching a specified number of classes and conducting a minimum number of dives to the highest level of that instructors training. They must also regularly meet the fitness requirements of the swim test and underwater breath hold swim, and regularly re-certify their teaching skills. What this means is that whom ever you choose for your training, you are guaranteed of the highest quality instruction. Regardless of where you are taking your GUE technical training it is some of the best training in the world. There are not a lot of GUE technical instructors around, so in most cases, it is a matter of either bringing an instructor to you or traveling to a location where an existing class is planned. This may seem like a relatively simple decision, but again, the devil is in the details and these details can have a significant effect on your training. Traveling to a location for training serves to focus your studies and attention and allows for very few outside distractions. In my case, I traveled to the Southern Caribbean and this freed me from worrying about getting home in time to feed the dogs or any of the other distractions of everyday life at home. I was able to devote 100% of my attention to my training. On the other hand, I was also diving with students I hadn’t met before. This can cause some difficulty but thankfully the standardized training and consistency offered by GUE helps to mediate this potential problem to a great degree. Most often, arriving a day early and arranging one or two dives with your perspective course members will be enough to get everyone on the same page and allow training to proceed without a hitch. This was the case for me and I can honestly say that this aspect proved to be no problem whatsoever in our courses. Keep in mind that if you do travel, you will most likely be diving in a location you are unfamiliar with and this could impact your degree of comfort in the water. You won’t be diving in the same location where you have been practicing so it is probably a good idea to arrive a little early and familiarize yourself with the new training sites. This can also double as a great time to become familiar with diving with your new course mates. I live in the Pacific Northwest and regularly dive in the waters surrounding Vancouver Island. For me, it was logical to start my GUE training in those waters. However, I also travel a good deal and very much enjoy diving in tropical waters. With the limited number of GUE technical instructors the reality is that GUE technical training classes are limited in terms of available spaces per class and also in the number of courses available per year. When an opportunity came up to take GUE technical dive training in the Southern Caribbean, I saw it as a way to combine some warm water diving with my technical training. Needless to say, going from a drysuit and heavy undergarment in 45 degree water to the freedom offered by a drysuit with light undergarments or even a light wetsuit in 84 degree water was pleasant to say the least! 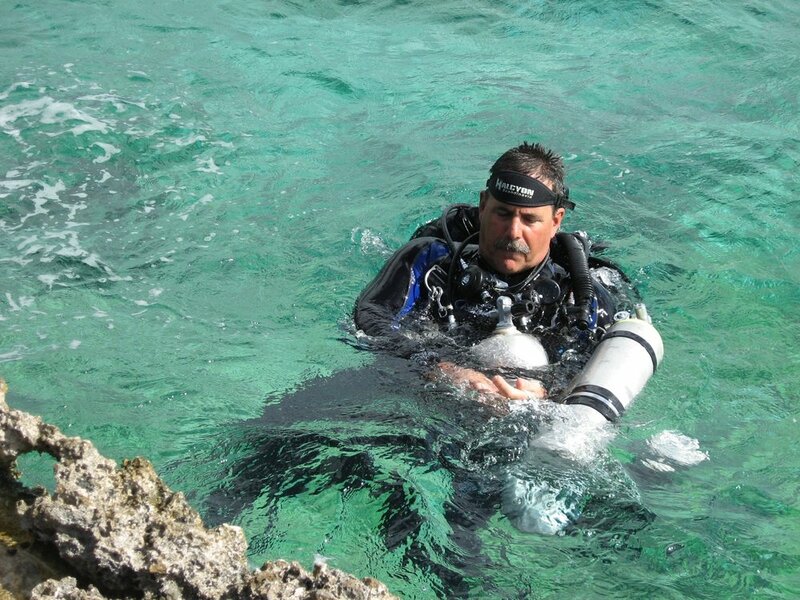 I had some previous technical training in cold water in addition to my GUE Fundamentals class and I was amazed with how easy it now was to accomplish certain exercises in the tropical waters off Bonaire that had previously been challenging in cold water. The mobility afforded by light drysuit undergarments or a light wetsuit, and no drygloves helped me set what I felt sure were world record times for valve drills. The benign environment meant that we were able to spend a good deal more time in the water developing muscle memory for particular exercises than what I had experienced in cold-water training. On several locations, it was simply a matter of refilling the tanks and jumping back in the water to continue our training, where we would have been severely constrained by environmental considerations in Canada. The nearly unlimited visibility also made it possible to maintain a good level of situational awareness in that it was relatively easy to keep track of all team members and the bottom was always visible. However there are no free lunches, and in this case our instructor cautioned us that training in this environment came with a big “but” attached. He made sure that we understood there was a world of difference between going from coldwater diving with drysuit, heavy undergarment and drygloves to diving in warm water with bare hands and minimal exposure protection, and vice versa. He took great pains to point out that we should work on building up the skills we had learned as we trained in our warm water training environment and systematically integrate them in our cold water environment back home. I am generally a conservative person when it comes to my diving and I was fully prepared to go back home and establish competency with the same exercises we had practiced in warm water. I believe that this attitude is absolutely crucial if you engage in technical training in warm water and also plan on doing some cold water technical diving. A technical dive with a significant deco obligation is not the time to discover that drygloves and thick undergarments significantly impede your mobility! This lesson was reinforced when I participated in a recent technical diving course where one of the students had traveled from a warm water location to do his training in cold water. I much admired the challenge this individual had set for himself and he did better than I would have expected. However, in retrospect, managing buoyancy with a heavy undergarment and working on clipping and unclipping stage and deco bottles with drygloves for the first time were probably challenges he would have chosen to do without if he had known the added complexity they brought to the course. As our world continues to get smaller, it becomes more commonplace for divers to dive in multiple environments. Indeed, the ability to do so is part of what makes this sport so endlessly fascinating. In addition, as mentioned earlier, world-class instruction doesn’t necessarily come around everyday and you may have to seek it out in a location that is not similar to your home diving environment. Thus, for many of us, the familiar adage of “train where you dive” is not a universal panacea. However, if the environment in which you took your new training varies from that in which you usually dive at home, it is only prudent to introduce your new skills and abilities to your regular diving environment in a gradual and conservative fashion. This will go a long way to building your confidence and make you more than a “region-specific” diver. One of the most fundamental issues that must be addressed when selecting your technical dive training location is the question of logistics. Both Bob Sherwood and Dean Marshall have written about this aspect of training in previous issues of Quest. In short, logistical support can either contribute to the learning process or significantly impede your ability to focus on the task at hand. As a former military officer, I recall being told that good military officers concentrated on tactics and strategy while great military officers concentrated on logistics. Logistical considerations cover a host of issues but for simplicity sake I have chosen to break them down into two sub categories; travel and gas supplies. Travel can have an important impact on your training. Have you allowed enough time to actually get to the training location? If you are traveling Internationally, this can have a significant impact: arriving at class with a case of jetlag can affect several days of study. As well it may also have an impact on the physiological component of the actual diving. It is also wise to consider any travel issues between your class room location and your dive location. For my personal training I was very lucky in that the class room, fill shop, gas supplies, and training dive sites were all within 50 yards of each other. This is not usually the case though, and I have also participated in technical training where we spent nearly two hours stuck in traffic as we traveled between dive site and class room. Gas filling and gas supply arrangements also need to be considered. Any time you need to spend organizing and arranging your gas fills for the next day’s dives could be better spent studying, eating, or sleeping. For classes run through an established dive centre in a major dive location, this question is not usually of concern. However, if you are traveling somewhat off the beaten path, it would behoove you to make sure these arrangements are in place and set up to run seamlessly. It is not the instructor’s responsibility to make sure you have all the gas you need. He or she is there to provide you instruction, not fill your cylinders so I suggest strongly that you ensure these arrangements are in place before the class starts. If you are considering bringing an instructor to your location for training you may also want to consider involving a local dive center even if you have the necessary gas fill and supply arrangements yourself. It may be less expensive to supply your own gas, but I caution that there is more here at stake than the costs associated with getting gas fills from a dive shop. In the end you trade money for your time, and time is something you have a very limited supply of during technical training. Staying awake until midnight mixing gas for your next day’s diving can seriously cut in to your study and sleep time. Remember to keep the big picture in mind and that big picture is getting the training you desire, and getting enough study time and rest is essential to this process. In summary, your decision in selecting a location for your technical dive training can have a substantial impact on your training. Ultimately the vast majority of us dive to have fun and while technical training can be demanding at times, it should also be fun. If you remember these key factors while making your decision regarding the location of your training, you can help ensure you will have a successful class and possibly even have fun!